Vertex Aquaristik has been a strong brand since they first debuted several years ago, but their product line hasn’t exactly been the most unified, at least when it came to aesthetics. 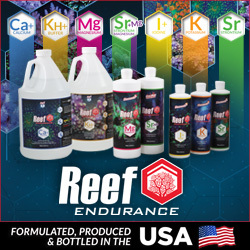 While they had many different products covering many different aspects of marine aquarium filtration, the equipment didn’t share the same look across the board. For example, the Vertex IN skimmers were made with black accent pieces while the Alpha cone skimmers were decked out in white and red. Fortunately, that’s all about to change as Vertex has done quite a bit of retooling to give all of their a huge chunk of their products the signature white and red color scheme. 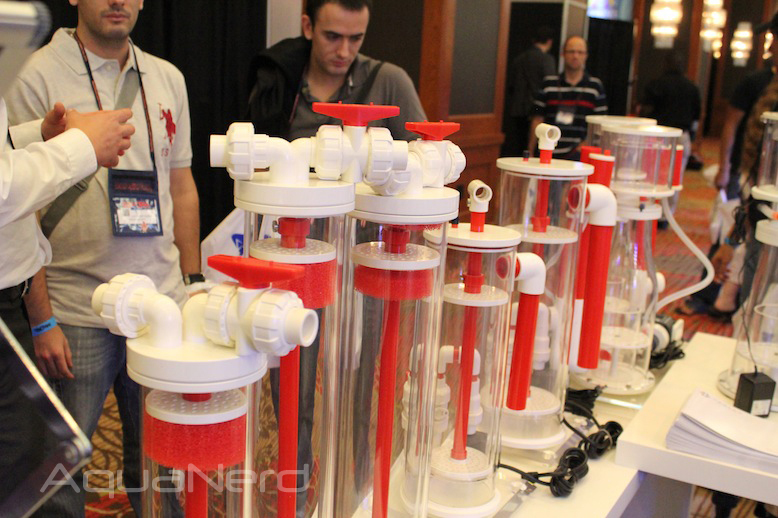 The first product to experience the big change was the IN series of protein skimmers, which was booted from the rest of the line in favor of the new Omega cone skimmer. 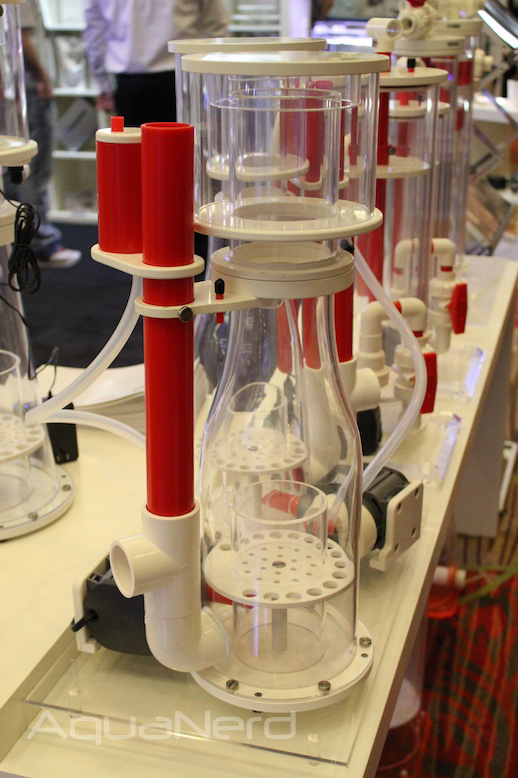 The Omega protein skimmers look very similar to the Alpha skimmers, featuring white accessories with red plumbing parts and ditching the older look altogether. 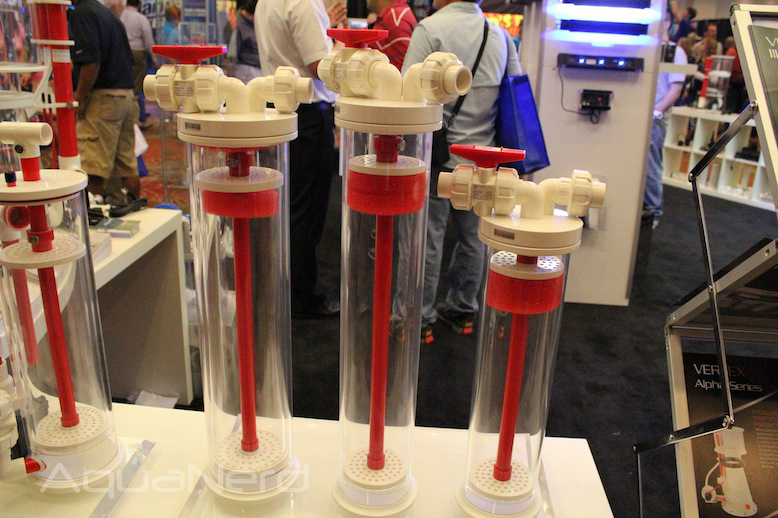 These new skimmers differ from the Alpha series in that they use a Sicce pump and a more elaborate cone shape. The UF media reactors are another subset of the Vertex line that’s getting the updated look. They are getting red internal plumbing and white base and top plates. Even the red sponges are playing into the color scheme as they are bright red instead of the usual black you see elsewhere. Besides the color change, the base of the reactors is moving away from the square shape and is being replaced by a circular base plate. The square plates really restricted how the reactors could be placed inside of the sump, and the round plates should allow for a lot more flexibility. Besides the media reactors and protein skimmers, the ZEOvit reactors are also getting the bold look that’s tying the line together. The overall shape and functionality of the reactor are unchanged, with the only differences we notice being present in the colors. We think this is a great push by Vertex and their new products are looking sharp. 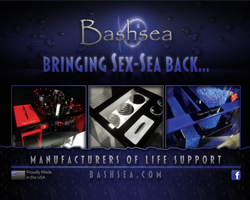 Now if we could just get them to start cranking out some white and red sumps, then we could really start seeing some well dressed aquarium stands.